In the name of the entire International League of Peoples’ Struggle, I am happy to keynote the 4th General Assembly of ILPS-Philippines. Today the Filipino people confront a terrorist and fascist counterrevolution launched by Duterte for US imperialism and his fellow oligarchs, big compradors, landlords and bureaucrat capitalists. Nonetheless he wants to make it appear that his counterrevolutionary government is a “revolutionary government.” Thus, the Filipino people are outraged, so are the people of the whole world by the lies and brutality of the US-Duterte regime. 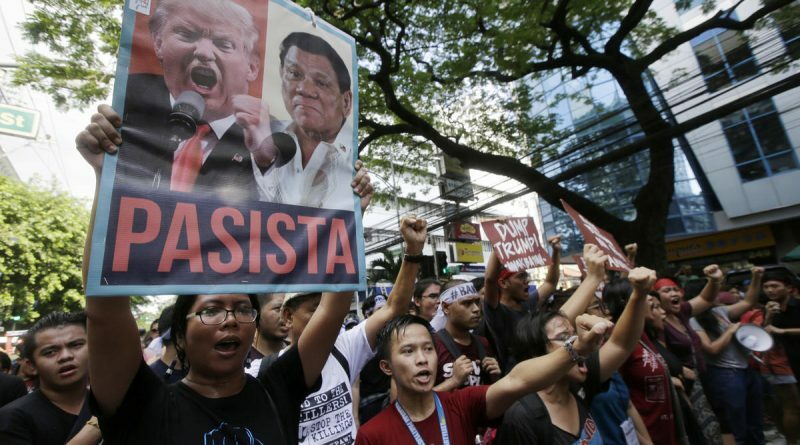 This regime is in favor of US imperialism having bases in the Philippines and “pivoting to Asia.” It is in favor of the US basing in this country US military forces and transnational corporations, with the foreign investors and speculators collaborating with the big compradors, landlords and corrupt bureaucrats like Duterte. ..
Trump’s eyes dilated when he visited the Philippines during the ASEAN meeting and he called the country a “prime piece of real estate” and “ideal military location”. “Perfect spot” he said. He gave Duterte strict orders. Now we are witnessing how the puppet is following what his master has ordered. Duterte further proved himself a traitor and a liar on his promise of change. He no longer wishes to have peace negotiations with the National Democratic Front of the Philippines, claiming that he would be pushed into a “coalition government”. He only wants war and the surrender of the revolutionary forces and the people to his treason and treachery. Duterte does not understand that according to The Hague Joint Declaration the peace negotiations are guided by national sovereignty, democracy and social justice and aim at forging agreements on social, economic, political and constitutional reforms as basis for a just and lasting peace. Duterte canceled the peace negotiations four days after the Reciprocal Working Committees on Social and Economic Reforms of both sides had initialed an agreement. He has disregarded and opposed the substantial agreement on agrarian reform and rural development as well as national industrialization and economic development. The US-Duterte regime will further push the Filipino masses into the quagmire of poverty and oppression. It will intensify the exploitation and oppression of the workers, peasants, fisherfolk, indigenous people and other toiling masses. Duterte knows that the struggle of the Filipino people will intensify and he wants to preempt it through state terror. He has repeatedly slandered the revolutionary forces and the legal democratic forces by tagging them as “terrorist” in order to suppress them through mass arrest, abduction, torture and massacre ala Oplan Tokhang and Oplan Double Barrel. He even said that he would follow the US in tagging the CPP and NPA as “terrorist”. And he has also admitted that he is a fascist and Amboy. Duterte is an evil beast. He is capable of ordering the killing of 15,000 suspected drug addicts who allegedly “resisted”, he is capable of bombing and occupying communities and he is capable of destroying and razing to the ground a whole city like Marawi. But he would never be able to stop the just struggle of the people that is carrying out a new democratic revolution through people’s war. Like Marcos whom he idolizes, Duterte is carried away by his greed for power and wealth. Thus he cannot grasp the fact that the revolutionary movement became stronger precisely because of the Marcos fascist dictatorship. The armed revolution against fascist dictatorship will grow stronger now that the chronic crisis of the semicolonial and semifeudal system in the Philippines is more intense and the revolutionary forces are far more experienced and stronger than in 1972. There is one more reason why Duterte wants to stop the peace negotiations. He does not want to discuss the needed political and constitutional reforms. He does not want the two sides to analyze what Duterte really wants in his version of federalism. It now appears that he wants to monopolize the decision on the kind of federalism or pseudo-federalism that he wants to impose on the Philippines. 8. fomenting the trend of divisiveness and separatism of some regions, especially in Mindanao. I will let other comrades to take up and elaborate on the tasks of fighting imperialism worldwide. I would just like to stress that ILPS stands as a firm pillar for this anti-imperialist and democratic struggle and ILPS-Philippines plays a key role and contributes greatly to this struggle. It is very important to link the anti-fascist struggle to the anti-imperialist struggle and further link this to the anti-feudal struggle. The anti-imperialist struggle is necessary because US imperialism is the instigator and supporter of fascism. The anti-feudal struggle is necessary because through it the decisive force is formed for winning the democratic revolution. At the same time, it is our task to form the broadest united front to isolate and overthrow the US-Duterte regime at the soonest time possible. This is not just a mixture of the Yellows and Reds that gives Duterte a nightmare. The anti-Duterte forces inside the reactionary government and armed forces also have an important role in rejecting and overthrowing Duterte. The revolutionaries and legal democratic forces are confident that in the struggle against imperialism and its reactionary stooges, the Redness of the struggle of the workers and the Filipino people shall stand out even more. We have a glorious past, present and future because of our struggle. Because of our struggle, a new dawn will arise for complete freedom, democracy and socialist future. Lenin was right when he said that the imperialist system is rotten and moribund. It is the eve of the proletarian revolution!